Graham Nash - "Songs for Beginners"
In this review we find ourselves journeying back to that turbulent time of the late 60's and early 70's. Everywhere you went, statements were being made against the war in Vietnam both large and small. In Washington DC, over 1000 veterans demonstrated in front of the Capitol, physically throwing their medals over the Capitol fence, marches were staged where over 350,000 veterans rallied, and in no small way, musicians and actors chimed in until finally in November, Nixon and the US Congress began a almost year long pullout of our brothers from Vietnam. After more than five years of antiwar demonstrations and protests, it seems that the antiwar activists and the American public had finally beaten the US government into submission. Little did we know what was to come. Not everything that happened in 1971 was bad. As a relatively young country, the US was making some progress. This same year, the courts outlawed DDT, the Supreme Court upheld school bussing bringing and end to segregation, the US finally stopped licensing commercial whale hunters and for better or worse, Greenpeace was founded in Vancouver. Songs for Beginners is one of those albums that reflects the times. Peace, love and introspection are what Graham sings about, only the way that Graham can deliver. Somehow this release doesn't sound dated. The music and lyrics are just as appripo today as they were back then. When you make this purchase, you are going to hear something just a bit different. Graham teamed up with our friends at Classic Records to remix this album. Graham talks about this in a recent interview with Coleman Brice of Classic Records on themusic.com. If you are a Crosby Stills and Nash fan, follow that link and listen to the interview. It was extremly interesting, and for me, answered quite a few questions about what I was hearing as I listened to this re-release for the first time. You will need to set aside about thirty minutes for the entire interview. It's well worth it. The interview is fed over the web via streaming audio in the MP3 format. Coleman has two different bitrates set up to accommodate the standard dailup connection (lofi) or those of you lucky sods that have DSL or higher connection rates (hifi). As I stated earlier, Graham assisted in the remix of this album and I have to say, it's far better than the original release. You are going to hear some differences though. 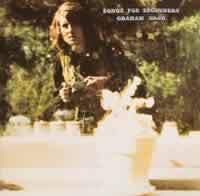 The vast majority of the album stayed pretty much true to form, but occasionally Graham may have chosen a slightly different studio take and then blended it in to the mix. Now, I see your antennas going up, but hold tight and read on, really. This remix isn't one of nasty ones that came out when CD's hit the market or worse yet, like what the Moody Blues did when they released their Greatest Hits, Legend of a Band album. Graham astutely added some much needed eq'ing, effects and leveling to the tracks. Previously, most of this album was harsh and seemingly distorted. No more. Every instrument and vocal track now take their proper place and are clear and filled with life. The vocal and guitar multitracks can now be distingushed, where before they blended together into an (at times) overbearing assult on your senses. To paraphrase Graham in his interview, "I needed to go back and clean up some of the mistakes that were made when we originally mixed this album.". From top to bottom this album is has improved dramatically. I say it has gotten better, but how so? Well, bass tracks now appear where little if any existed before. You can now actually hear Dallas Taylors kick drum in several of the songs. But those little tidbits don't even scratch the surface. In the song Better Days, Grahams multitrack vocals are now separate and distinct. He comes to life rather than you just listening to a recorded vocal. You will also notice some very minor changes. The drum and sax are now slightly wet. By that I mean they added a bit of reverb to them where it didn't exist before. And it was just enough to bring the song to life. Simple Man just dreamy. Sorry for that discription, but you have no idea how much better this sounds. You now know there is a cello in the background. The fiddle now sounds like a fiddle rather than nails on a chalkboard. Several of the songs are just unbelievably better with the new mix. I Used to Be a King and Man in the Mirror being two of them. I don't want to spoil the fun of your first time listening to them, so I won't give you any details. But I have to say, the absolute, pick of the litter is Sleep Song. You know that Voice of God that everybody is always talking about? I found it. It was hiding in Sleep Song. The remix might be as close as you can come to the sound of Graham preforming this live in your living room as you can come. It's that good. Here I go again, blathering on and on about how great a job that Classic Records has done. Not to slight our great friends at Classic but if Graham Nash hadn't been involved I would be writing a completely different review. Only his prescious and unique insight to the original making of this timeless classic, coupled with his love for vinyl (yep, that's right, listen to the interview), could create such a fine work. So, we're going to try something completely different now. Coleman, Lucio and I have worked out a little bonus for you, our faithful readers. We have come up with a plan that you can get a 10% discount when you order Graham Nash's Songs for Beginners direct from Classic Records. This offer only applies to online orders direct from Classic Records, not any of their worldwide distributors. Just log onto the Classic Records website, order this album and you will receive the discount. Heres the catch. You have to plug in a keyword in the order form. 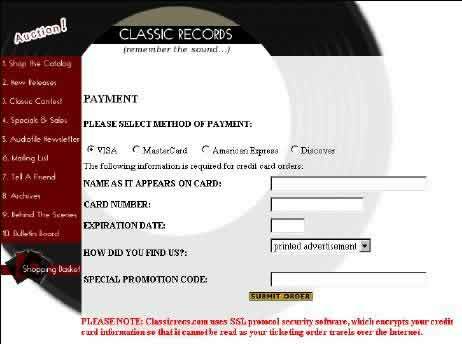 If you look closely, you will see in this screen clip of the Classic Records online order form, there is an entry for a Special Promotional Code. That's where you type in the keyword. This promotion will be valid until the last day of the month, of the month that follows the date of the review. Or in other words, you can use this discount until the end of November, 2001. Classic Records is in the process of redesigning their online ordering web pages to accommodate overseas orders. Currently, they cannot accept any orders outside of the USA on their website. That means the discount won't apply for you if you live overseas until their new online order form is finalized. If you live overseas or outside of the States and want to order this or any other Classic Records release, they have a webpage devoted to dealers in your area on their site. With some luck, we should be able to include everybody in the next promotion. So what is this keyword? Well, in the next paragraph you will find a definition of a musical term. I'll highlight the word that is designated as the keyword and at the same time I'll be helping you expand your musical knowledge (maybe, that's the plan anyway). OK, so heres our definition of the week. And the answer is pizzicato. Art, what is known as plucking the strings of an upright bass (rather than using a bow, or arco style). Now, if this little promo works, and enough of you order Songs for Beginners, TNT and Classic Records may be able to offer you this same discount on my future Classic Record reviews. What's on tap in the coming weeks? Genesis, The Lamb Lies Down on Broadway, Miles Davis, Kind of Blue (corrected speed on Quiex), Satchmo Plays King Oliver and just maybe Pete Townsend, Scoop 3 on 45's.